Will New England Patriots quarterback Tom Brady face as much heat from the Los Angeles Rams’ defense as he does from media and assorted celebrities for his friendship with President Donald Trump? Brady and Trump have been friends since 2002, the same year that Brady judged the Trump-owned Miss USA competition. In 2015, Brady displayed Trump’s signature MAGA hat in his locker. Actor Daniel Radcliffe, who likely knows more about quidditch than football, said Brady’s display of the hat prompted the star of the Harry Potter movies to root for the Rams. “Take that MAGA hat out of your locker. I feel like that was the moment when as a country we were all like ‘Come on, dude! You’re awesome…Don’t put that in here,’ ” Radcliffe said. Brady, who was going for his sixth Super Bowl title on Feb. 3, has stood behind his friendship with Trump. 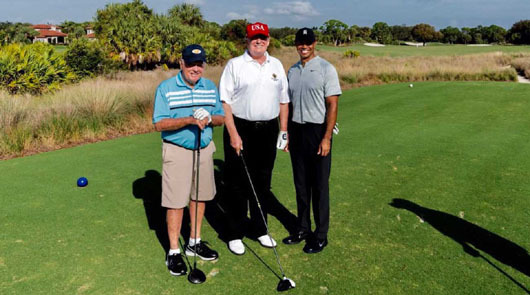 Meanwhile, Trump hit the greens at his course in Jupiter, Florida on Feb. 2 and many in the major media played up the president’s post-government shutdown outing with Tiger Woods and Jack Nicklaus. Most of the same media ignored House Speaker Nancy Pelosi’s vacation in Hawaii or a group of Democrat lawmakers partying in Puerto Rico – which occurred during the shutdown. “Great morning at Trump National Golf Club in Jupiter, Florida with Jack Nicklaus and Tiger Woods!” the commander in chief tweeted. In 2015, the Washington Post reported that playing partners said Trump often cheats. “When it comes to cheating, he’s an 11 on a scale of one to 10,” sportswriter Rick Reilly said in that story.